Celebrity sails from Seattle or Vancouver on the northbound route and from Seward on the southbound route, and of course also offer round-trip service on their sailings if you prefer. 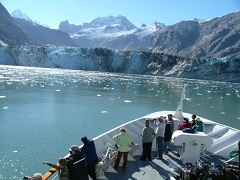 Over forty Alaska shore excursions are offered to further enhance your time in the 49th State. Whether you enjoy hiking, fishing, kayaking or just taking in the sights, there is an excursion that will leave you with fantastic memories of your trip. Take a cruisetour as part of your Celebrity Alaska cruise and experience Denali National Park, Fairbanks, the beautiful resort town of Whistler, B.C, or many other destinations further inland than most cruises take you, because Alaska isn’t just rocky coastlines and towering glaciers. A Celebrity cruise offers you an innovative design in its ships, impeccable service from its entire staff and a state of the art spa coupled with exquisite fine dining experiences. It is no wonder they are the highest rated premium cruise line sailing today. A Carnival cruise to Alaska can offer you the sights, and a Holland America Alaska cruise may tempt you with their routes, and both have entertainment, dining and amenities, but for premium sailing and spectacular add-on trips, nothing beats the Celebrity experience. With family oriented activities available and children’s activities on most cruises, the whole family can enjoy their vacation together, while taking in the sights and sounds that are pure Alaska. With a Celebrity Alaska cruise you will never want for anything. From the first minute on board you will realize why Celebrity leads the way in luxury sailing. Attention to detail and the desire to please are what make the staff of Celebrity stand out from the rest. Spacious cabins and private verandahs make for an incredible view of the coastline and the majesty of the mountains, right at your ‘back door’. If you have never cruised with Celebrity before, come and see what you have been missing. Embark on a great adventure to the last frontier of our great country, all while being in the lap of luxury. This is what a Celebrity Alaska cruise is all about.